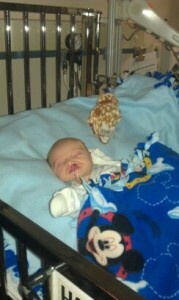 Our son was born with a cleft lip and palate. Things have been difficult for us since day one. Cole was hospitalized for pyloric stenosis, and failure to thrive for the first couple weeks of his life, and the nurses at Akron Children’s were so supportive of us. The NICU nurse even had some handy tips for newborns that she had learned over her 23 years as a NICU nurse. We’ve had several hospital stays since we met that nurse, and she always remembers our family. The Craniofacial Clinic at Akron Children’s has always gone above and beyond in their care, and they have always treated us like close family. We love all of them! Every employee at Akron Children’s Hospital has a heart of gold, and I’m so glad that we have them by our side. No matter how simple or extreme, their care and compassion is unwavering.